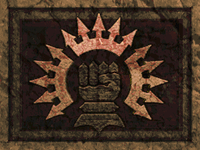 The Crowns are one of the two political factions that Redguards typically align with. After the death of their High King, Thassad II, they fought against the Forebears for their country's continued sovereignty in Hammerfell's civil war. The capital city of Sentinel was lost quickly in a Forebear uprising called Volag's purge. Prince A'tor, the new leader of the Crowns, was forced to retreat to Stros M'Kai and regroup. The war continued and the Crowns managed to recapture Sentinel, but the Forebears had allied themselves with the Empire. The Empire turned the tide of the war, culminating in a major defeat at the Battle of Stros M'Kai. A'tor was presumed dead by the enemy, but his soul was stored in a soul gem and his body hidden in the Temple of Arkay. The few Crowns that survived the battle met their end in the city's Old Quarter, where the Empire's dragon burned most of its buildings to the ground. A'tor was secretly allies with the Restless League, but during all of these events they were cautioned to stay back. The only known Crowns left in the months that followed were noncombatants. If the Empire found out anyone was a Crown or aided the Crowns, they were thrown in the Jail. The dead were given to the dragon to eat and their souls were trapped in N'Gasta's soul snare. Eventually, through the adventures of Cyrus on Stros M'Kai, the Prince is restored, although bound to his sword, and the resulting rebellion of Crowns and League combined drives the Empire from Stros M'Kai. * Cyrus considers the Crowns a distant part of his past at the beginning of the story, but by the time he gives his speech with the soul sword, he has made the Crown cause his own.